Switcher Studio provides options that allow you to display multiple camera angles and sources at once. For example, you could show a graphic or a computer source using Switcher Cast while also showing a live camera angle. You can also use a Picture-in-Picture effect to display a floating window from another camera angle. In this article, you will find instructions on using these effects and an overview of the available "Multi-View" options. 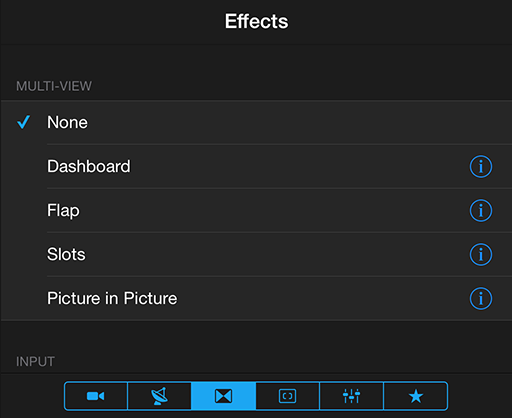 Open the "Effects" tab and scroll down to the Multi-View menu. 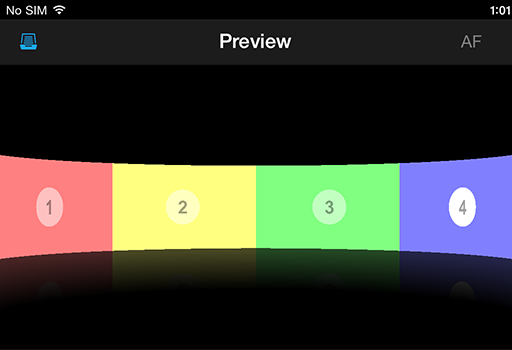 Tap an effect to enable Multi-View Effects. By default, the effect is set to None. Select None again to disable Multi-View Effects. Each time you tap a source in the "Cameras" pane, the source will be toggled on or off in the "Preview" window. The appearance of each effect will be determined by the order that you toggle in each source. For example, when the Picture-in-Picture effect is selected, the first camera you tap will be the background source, and the second camera will be displayed in a smaller, floating window. The same is true for the Flap effect. When using the Dashboard and Slots effects, sources will stack from left-to-right in the order they are toggled. 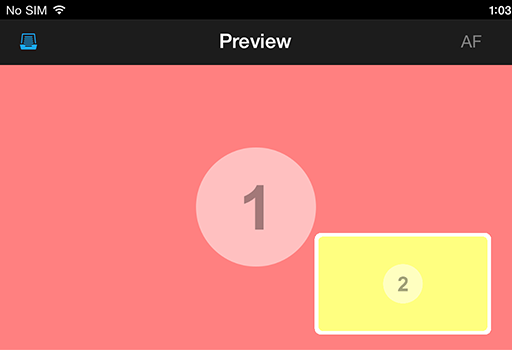 To send your Multi-View composition to the Live Output, tap "Preview → Live". The Dashboard view allows up to 4 sources to be viewed on the screen simultaneously. Each source is added to the screen from left to right like a virtual set of floating monitors in the order that they are tapped, or toggled. Each source will be shown in full frame but scaled to fit in the output window. Duration - When a second source is added or removed from Multi-View composition in the Preview Window a special transition will take place. Each effect will have a different transition. 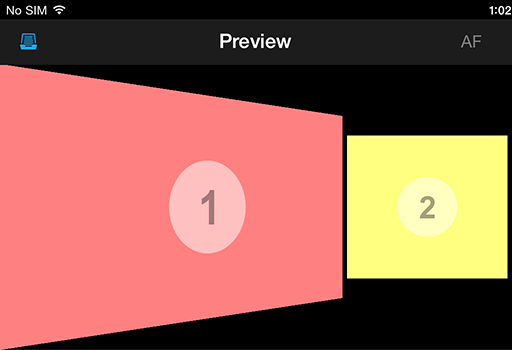 Horizontal Gap - Adjust the gap between each angle in the Multi-View. Reflection - Adjust the intensity and opacity of the reflection. Reflection Gap - Adjust vertical gap between each source and its reflection. The Flap Multi-View setting allows up to 2 sources simultaneously. This view is ideal for presentations where the slides or graphics can be shown in a large virtual screen along side a smaller virtual window containing a speaker or other live source.The first source will be the larger Flap, and the second source will be the smaller Inset. Flap Angle - Adjust the skew angle of the first source. Flap Scale - Increase or decrease the size of the first source. Inset Scale - Increase or decrease the size of the second source. Flap Margin - Adjust the margin around the first source. Inset Margin - Adjust the margin around the second source. Flap Format - Adjust the aspect ratio. Changing this value will crop the image. The Split Screen view allows up to 2 sources to be viewed on the screen simultaneously. Each source is added to the screen on either the left or the right in the order that they are tapped, or toggled. Each source will be cropped horizontally to fit in the output window. Only a vertical section of each source will be shown as more sources are added. The Slots view allows up to 4 sources to be viewed on the screen simultaneously. Each source is added to the screen from left to right in the order that they are tapped, or toggled. Each source will be cropped horizontally to fit in the output window. Only a vertical section of each source will be shown as more sources are added. Center -- Centers each source in its respective slot. (The image above is shown with Center set to "ON"). The Picture-in-Picture view allows up to 2 sources to be viewed on the screen simultaneously. The first source will function as the background image. The second source will be placed on top of the background, scaled down, and then positioned in the lower-right corner. 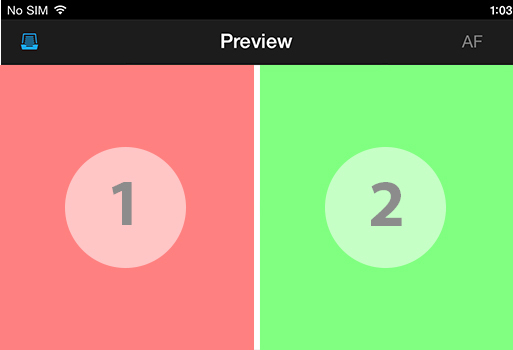 Adjust the size and position of the second source by pinching or pulling with two fingers or dragging with one finger while it is cued up in the "Preview" window. 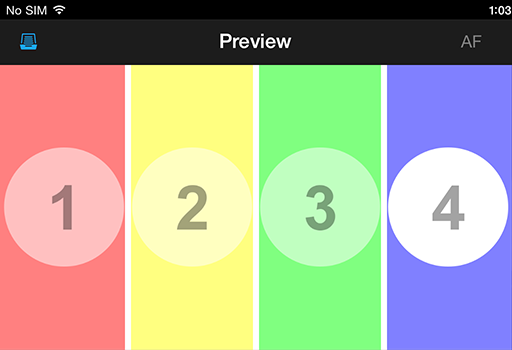 Rounding Radius - Adjust the rounded edges of the Inset image. Position X - Adjust the horizontal position. (You can also drag with one finger to adjust X and Y Position). Position Y - Adjust the vertical position. (You can also drag with one finger to adjust X and Y Position). Scale - Adjust the scale of the image. (You can also Pinch and Pull on the second angle to adjust the Scale).